Answer: Except d all are divisible by 4. 3. Pointing to a photograph, Amrita said he is the only son of my only brother’s son in law. How is Amrita’s brother related to that boy? 6. All the surfaces of a cube of 4 cm are painted red and it is cut in small cubes of 1 cm. How many cubes will not have any of their surfaces painted? 7. All the surfaces of a cube of 4 cm are painted red and it is cut in small cubes of 1 cm. How many cubes will have all the three surfaces painted? Only corner cubes have all three faces painted. Directions: (8-10) Six persons A, B, C, D, E and F are sitting in a straight line. F sits at an extreme end of the line. C sits at a place right to F. D is immediate neighbor of F and A.B sits to second to the right of C.
8. Which of the following pair sits at extreme ends of the line? 9. Who sits to the immediate left of B? 10. What is the positon of A with respect to C? 3) Pointing to a photograph, Amrita said he is the only son of my only brother’s son in law. 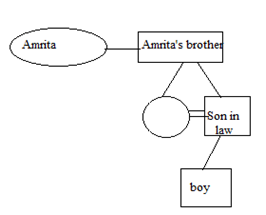 How is Amrita’s brother related to that boy? 5) Which one set of letters when sequentially placed at the gaps in the given letter series shall complete it? 6) All the surfaces of a cube of 4 cm are painted red and it is cut in small cubes of 1 cm. How many cubes will not have any of their surfaces painted? 7) All the surfaces of a cube of 4 cm are painted red and it is cut in small cubes of 1 cm. How many cubes will have all the three surfaces painted? Six persons A, B, C, D, E and F are sitting in a straight line. F sits at an extreme end of the line. C sits at a place right to F. D is immediate neighbor of F and A.B sits to second to the right of C.
8) Which of the following pair sits at extreme ends of the line? 9) Who sits to the immediate left of B? 10) What is the positon of A with respect to C? 1). Answer: Except d all are divisible by 4.